MailEnable delivers a high-end mail solution that is scalable and flexible enough to cater to any size organisation, from small business to large corporate entities. The product is secure and stable with features that cater specifically to the corporate market. MailEnable includes a list server that can allow you to run your own email-based subscription lists. These lists can be useful for obtaining user feedback, keeping customers updated on new products or features, distributing electronic newsletters or flyers, providing technical support or a question and answer forum. The list can be moderated or unmoderated, and allows users to subscribe and unsubscribe automatically. updated between Microsoft Outlook and MailEnable's Webmail interface. Information including tasks, calendars and contacts can be synchronised automatically when entered into either Webmail or Outlook. Rich text and HTML editing add colour and dynamic to Webmail. Webmail users can share calendars, folders, tasks and contacts with other Webmail users. Public Folders give users access to shared information via their Webmail client. Webmail skins can re-brand your Webmail interface with your own corporate look, from buttons to backgrounds to your own corporate logo. MailEnable supports the following mail protocols, POP, SMTP, and IMAP. IMAP allows you to manage multiple folders on the server. Mail can be accessed from different machines, as the mail is hosted on the server and allows the user to just download message headers and envelope information, leaving the body of the message and on the server, until the user selects the email to download. This is useful when operating over slow speed dial-up connections. IMAP also enables you to store common and relevant information (e.g. company policies, forms etc) in Public Folders for all users to access. Administration is a necessary cost of operating MailEnable, or any mail server. MailEnable is designed in such a way to reduce the amount of time systems administrators spend managing the mail server. By providing the necessary tools and resources to support systems administrators, they can manage the system efficiently and productively. 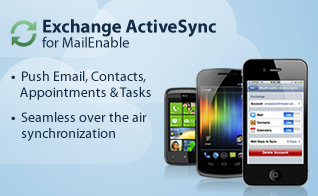 MailEnable requires only minimal on-going system management. The mail servers or even clusters can be configured and maintained remotely from anywhere with an internet connection, via remote administration. MailEnable has low hardware requirements. The platform is lean and robust, designed as an enterprise level mail solution, and performs well even on minimal hardware. There is no per-seat licensing on any product. MailEnable allows you to host unlimited domains and users. Therefore, even as your business grows, the cost of your licensing remains the same. MailEnable provides a secure messaging platform to safeguard your system against unauthorized access, unsolicited mail and viruses. MailEnable employs several methods of blocking or filtering spam, so that junk mail is minimised. MailEnable features message and content filtering, allow/block lists, SPF, auto-training Bayesian filtering and several other features for stopping unwanted e-mails being delivered. Message throughput can be restricted by mailbox or post office to help prevent spamming through the mail server. To protect your system from viruses, MailEnable integrates with a number of Anti-Virus solutions in order to scan for viruses on all incoming or outgoing messages. MailEnable has inbuilt measures help ensure that your email system is compliant with relevant legislation. Authentication methods such as CRAM MD5, NTLM and advanced relay settings control user access to your mail server. Security features such as access controls for sysadmin, admin and end users which locks out unauthorized users from accessing certain parts of the system. The List server has opt-in capabilities to comply with anti-spam legislation and a plug-in utility allows you to store, archive and retrieve all message that pass through the system. MailEnable allows clustering of servers and also for storing configuration data in Microsoft SQL/MySQL. The system only stores server specific configuration data in the registry of the local machine. This effectively means that you can install multiple server nodes and point them at the same storage repository. By load balancing and clustering front-end servers (IIS, SMTP/POP, IMAP) the system can effectively scale out very easily. From a systems administration perspective, Web Administration gives you the freedom to manage multiple post offices centrally from your desktop, or to delegate administration rights to individual post office managers to manage their own configurations. Manage users, mailboxes, lists, groups and domains from your web browser. Web Administration includes search features for domains or users, essential for when you are hosting multiple domains and large numbers of users. Remote administration allows you to manage a server or server clusters centrally from any machine connected to the Internet. MailEnable gives you the ability to configure settings by mailbox (user) or by post office (domain/s). This allows you to add or remove mail services for certain users (e.g. Webmail, IMAP access, anti-virus scanning). As server administrator you can create global filters to control your mail content, run applications, copy emails to one or more other users, add headers, strip email attachments, delete messages, forward mail and much more. To save on disk space, mailbox clean-up agents can be set for polling intervals to clean up specific mailboxes. Quota limits can be allocated to users or domains and can automatically inform users who are over quota. MailEnable Integrated Authentication allows you to use Windows Authentication as well as MailEnable's inbuilt authentication. It also allows you to have mailboxes created as users successfully authenticate using Windows Credentials. MailEnable provides comprehensive and responsive support - including user forums, online searchable knowledge base, full product manuals, and access to experienced technical support people. When you purchase MailEnable, you will receive two free support tokens, valid for 3 months, to assist in the process of installing and configuring your mail server. For more information on support and response times see our support policy.